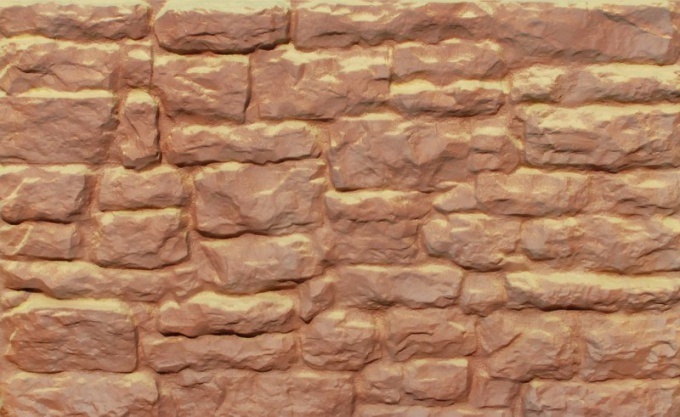 Wild stone is well suited for exterior and interior finishing of country houses. Room, when decorated with this material, acquire a unique identity. Cost of artificial stone in stores is quite high, but it can be made at home. Start with casting. To do this, pick an appropriate sample. Fabricate the formwork for pouring of the plastic panels. It should be wider and higher edges of the sample for 1 centimeter. Cut the walls and bottom of the formwork glue. You can also use to fill any size plastic container, for example, from under the ice. Prepare a soapy solution. To do this, dissolve in a small bowl with warm water and two drops of dishwashing detergent. If the sample you are using gypsum, cover it with three layers of varnish or lacquer. After which the specimen and the formwork liberally lubricate with grease. Put the stone into the mold and start casting. Carefully cut off the spout of the container filled with universal, transparent silicone. Squeeze the silicone into the form. If you use more than one cylinders, utrambovyvaya silicone with the help of the prepared soap solution. To do this, dip the brush and soak the silicone, and then tamp it. At the end of the fill, take a spatula wetted with soapy water and level the surface. Leave the sample to dry. After the silicone dries, dismantle the formwork and remove the resulting form. Wash it in soapy water. Start casting stone cement. To do this, measure one part sand and three parts cement. To give the stone a certain color use dyes for concrete. The number should be 3% of the total weight of the cement. The dye accumulated in the syringe, mix with sand, then add cement and stir. Add water until the consistency of thick cream. Pour half of the mold with cement mortar and tamp. Using a spatula, made of rammed cement bumpers at the edges of the shape. Cut a piece of painting in the grid so that it was less the outline of the shape, and cover them bottom. Then take a small amount of cement mixture without dye, put it into the form and tamp again. Close the form fluted glass. After 12 hours, remove the stone from the mold. To the final stage it will be ready in just a few days after the cement will gain strength. Cover wild stone with one coat of varnish, and then can use it for decoration. Manufacture and sale of artificial stone, tiles of "Wild stone", thermopanels facade brick. Price list. 'Shops.